In my previous post ”Dude, here is your model” I suggested to model the supply in the economy with what I called a Sumnerian Phillips curve in a attempt to help Scott Sumner formulate a his ”model” of the world. 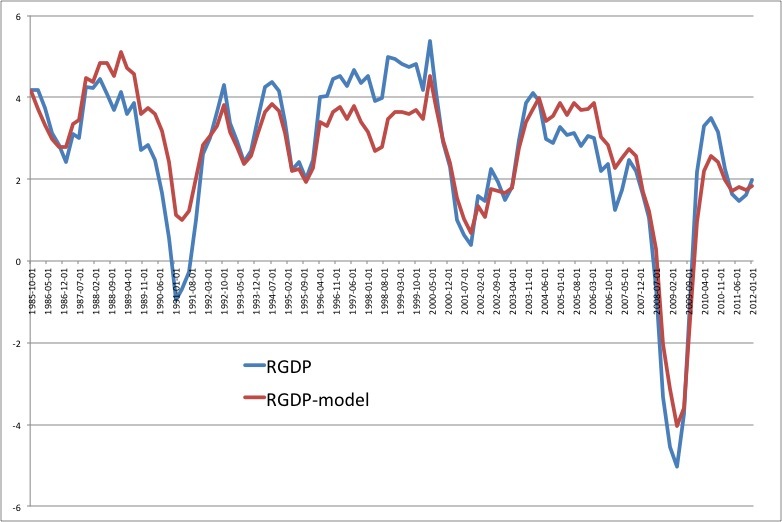 Where Y is real GDP and Y* is trend growth in real GDP. N is nominal GDP and NT is the central bank’s target for nominal GDP. a is a constant. It should be noted that Martin formulates (1) in growth rates rather than levels. As the graph below shows Martin’s suggestion seems to fit US data very well. One thing is very clear from the model. The Great Recession was caused by a sharp drop in NGDP. The Fed did it. Nobody else. It also shows that there is no supply side explanation for the Great Recession. The drop in real GDP can be explained by nominal GDP. It is very simply. Too simple to understand maybe? If you disagree you have to argue that the Fed can not determine nominal GDP – may I then remind you that MV=N=PY. Or maybe we should ask Gideon Gono? So what are the policy lessons? Well, first of all if the central bank keeps N growing at a rate comparable with the target then real GDP growth will also remain stable. But if the central bank allow N to drop below target then Y will drop as well. Hence, recessions are always and everywhere a monetary phenomenon. I too feel like screaming. It’s too simple. I wish I was oblivious, I wish I could believe the Keynesian religion and believe that all we need is more fiscal. But the central bankers… they have gone insane, trapped in their models with their simple targets. Britmouse, I am afraid it is worse. They are not insane. The full well know the damage they are doing. I am way past screaming. With the 10 yr Bund at 1.16% and the 10 yr treasury at 1.47%, i am now in the running for the hills phase. BTW, i find it quite ironic that: “Draghi told a European Parliament committee in Brussels that without more aggressive action by policy makers the euro is being shown now to be unsustainable unless further steps are being undertaken.” (from this mornings Bloomberg article). b) this is analogous to Bernanke in Sept 2008 focusing on bank bailouts while leaving the Fed Funds rate at 2% in the middle of the crisis. History suggests this does not work out well. dwb, I was also very disturbed by Draghi’s comments. I had hoped that he would be different from Trichet, but his comments over the last couple of days have been very worrying. I am deeply worried about where we are heading if the ECB does not act very soon. my interpretation of Draghi’s comments, and i always hope i am wrong, is that he thinks that: a) we are headed down the slope fast; b) whatever he does will further increase Germany’s credit exposure; c) he is unwilling to unilaterally do that without the political resolve to accept it in Germany. Even a higher inflation target (ahem, a correct inflation target), would require the buy-in of the Bundesbank and other central banks, so Germany needs to sign-off on it. To be fair to Draghi, he’s in a no win situation: If he unilaterally decides to raise the inflation target or bail the banks, Germany and the North will scream “violation of the Maasricht treaty” and he will get no credit for “saving the euro” because many people still think its not in danger. If he decides for action and it’s either too little or too late, he’ll get hammered for increasing Germany’s exposure. On the other hand, if he does nothing and blames it all on Germany, at least he covered his arse. I am not apologizing for him, but on the other hand, I can’t say it would be me jumping off the cliff by myself either, I’d definitely want Merkel and Weidmann holding my hands. i hear JP Morgan is looking for a CRO. lol. I don’t believe they understand the impact of their actions. I refuse to believe it. How could any human being in sound mind understand the impact of their actions and still carry on? The Cbankers accidentally killed the economy in 2008 and it was such a psychological shock they are still travelling through the 5 stages of grief. Unfortunately we are still stuck at “denial”, god knows what happens when they get to “depression”. Yup. The large drops are all nominal; it’s very persuasive in my opinion. 1. First Gulf War started 08/1990; this explains the drop in RGDP beyond the deviation from NT in that period. 2. Above average growth over ’95 to ’99; I think we can strike that up to NAFTA but more importantly to cutting the deficit. 3. 2000-2004; no deviation despite tax cuts and such (supply-side policy), does this confirm Friedman’s adage “to spend is to tax”? 4. 2004-2007; minor discrepancy, can we strike that one up to the housing ‘bubble’ rising and bursting? I am more sure about 1 & 2 (large deviations), not so much about 3 & 4. Martin, I agree – discrepancies mostly can be explained as supply shocks. In fact I think the model can actually be used to separate supply shocks from demand shocks. The residual in the model is simply supply shocks. It can get worse. Financial regulation by tackling the supply-side and not recognizing the monetary causes of the recession might permanently lower output in the future. I was particularly stunned by Draghi’s rather blunt recusal of any obligation to deal with the crisis without talking constructively about how it could be solved if it were given permission to solve it. Of course he is correct in a legal sense, but I wonder why the insane and irrational fear of inflation isn’t being refuted to the point of being tossed into the dust bin of history’s lies. It really boggles my mind how anyone would sign up for a currency treaty where the central bank bears no social responsibility for appropriate levels of liquidity. That is just asking for a humanitarian disaster. But it is even worse in places where the central bank does bear that responsibility, like here in the US, and it gets a pass for ignoring it. If our world does come unglued, it is because everyone has just simply gone insane. And a = 0.75 => a/(1+a) = 3, for a relatively “flat” AS schedule in (P,Y) space. Sumnerian macro is not much different from standard NK macro, except that he pays more attention to levels than rates and chooses a slope of the AD curve of -1. One point though, what substitution shows here is that you can discuss NT in terms of P; it’s just exceedingly difficult to talk about in terms of P.
(1) Estimate P instead of N.
(2) Estimate Y* to see whether the supply shock is permanent or temporary. If the supply shocks permanently changes the growth rate you’ll have a permanently higher or lower Y*; do you say you lowered or raised P* in response? In terms of the static model you just plug in a new value for Y* and you continue with higher or lower inflation. Similarly with temporary shocks to Y*; you can’t really say that you’re targeting long run-inflation and that this temporary increase or decrease in P is okay. For that would be inconsistent with the above. Perhaps I am wrong, but as I see it you can’t think in terms of NT and talk about it in terms of P. You either have to think in terms of NT and talk about it in terms of NT or you have to think and talk about it in terms of P.
The Great Recession was Bernanke’s mistake. It was predicable & predicted. T. Congdon (a British economist from the City) has been “attacking” central bankers and regulators since 2008 for the same reasons set in your post . We have been in touch in the last years and had interesting conversation on this. He came last week to Madrid to present his latest book (http://www.frdelpino.es/conferencia-timothy-congdon/) and explained how new banking regulations (Basel III and others) and a myopic monetary policy have resulted in a major recesion. As you do, he bases his critiques using the monetary determinantion theory of nominal income; and thus on a model in which the supplier of money to the economy has the tools to keep nominal income on track again by adopting expansive monetary measures. He has made very good points on this and I do agree with his approach. He is indeed a very good monetarist economist! Yes, Tim Congdon has had a similar view of the crisis as the market monetarists even though Tim tend to stress more traditional monetary analysis. Obviously there is no conflict between the two types analysis – they supplement each other. Regarding Basel III there is no doubt that the new regulation is putting serious downward pressure on money-velocity and the money-multiplier in the euro zone (and outside the euro zone). That would be no problem is the ECB was making up the difference by expanding the money supply, but we all know that the ECB unfortunately has utterly failed to do this. Euro zone money supply barely grows at the moment.